TOUR GUIDE RESPONSE: Thank you very much for this amazing review. It was a true pleasure spending the day with you. You are always welcome in this beautiful city. Hope to see you two soon. Hatice is a superwoman. My wife and I have had a 7-days tour of Istanbul with Hatice, and come to the conclusion that there is nothing in Istanbul that Hatice is not able to manage and arrange. Istanbul has many interesting places, the local people are courteous, food especially the lamb kebab is tasty, souvenirs shopping is great, and with a population of 20 millions, the city feels clean and safe, and the traffic really is not that congested. Toursbylocals's gold standard tour guide = Hatice. Highly recommend Hatice. To quote my wife - 'it was like being shown around Istanbul by an old friend'. We only had 7 hours in Istanbul - Hatice met us at 5am on a Sunday with a bright smile and a big hello. She customized a plan with a great combo of walking, history and culture; eating delicious turkish food; riding a ferry to Asia; exploring the spice market; and finally a tour thru the Hagia Sofia - all the while giving us a glimpse into her own life and history. A magical, special day w Hatice. Exploring the true marvels of Istanbul with Hatice as a guide was such a good decision- a completely different type of experience. Hatice made me feel welcome, comfortable, and almost like an insider myself. Her professional driver picked me up at my hotel and whisked me to meet her at the Dolmabahçe Palace. I quickly began to realise that not only was I gaining local insight, but that my guide was extremely intelligent and knowledgeable. I am still glowing from the trip- what a magical experience. Hatice is one of the best tour guides I have ever met, she is so smart to know what you like and what you dislike and then arrange the tour accordingly in a perfect way. I enjoyed the tour a lot and didn't want the time to run quickly as I enjoyed every moment. Thank you Hatice for this great day. TOUR GUIDE RESPONSE: Thank you very much for your wonderful review. It was pleasure guiding you. TOUR GUIDE RESPONSE: Thank you very much for your kind words. It was a pleasure to guide you. I wish you all the best. 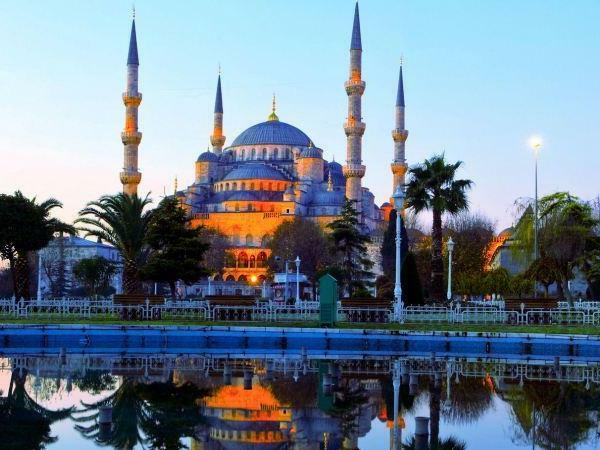 Istanbul is a very beautiful city, and there are many places to visit, but it's also very big and for a first time traveler to Istanbul it can be hard to find all the good places. I highly recommend Hatice as a tour guide. She was very effective and informative, and she's a very kind and caring person. I had a tour with Hatice on my first day and since Hatice were so thorough, based on information she gave, the rest of my vacation were very good. I highly recommend City Highlights Private Walk with her. This is our second walking tour with Hatice and even though she was not feeling well, she conducted the tour in a similar enthusiastic manner. This was also a great walking tour and I liked the fact that she incorporated stops to allow us to enjoy Turkish foods in restaurants and cafe's that she herself recommends. Her knowledge of food and also her familiarity of the local area and people made this tour an enjoyable experience. I highly recommend this tour and Hatice as a guide. TOUR GUIDE RESPONSE: Dear Timothy, Thank you very much for your great review. It was an absolute joy to guide you through Istanbul's historic streets. I really hope to meet you all again. It was first ever visit to Istanbul. I had no idea about anything to visit, but Hetic welcome us like family. It was great time with her. She has great deal of knowledge about history.It was just one day tour with her, but she kept in touch till last moment. TOUR GUIDE RESPONSE: Thank you very much for your great feedback. It was a pleasure to guide you. Really enjoyable tour. My guide Hatice was friendly and pleasant and was on time to meet with us. Even though it was a miserable, wet and cold day, her enthusiasm of showing us her city made our tour very enjoyable. She also stopped frequently for refreshment stops and was truly helpful in introducing us to "real" Turkish cuisine. A great tour and an exceptional guide. TOUR GUIDE RESPONSE: Dear Timothy, I am so glad that you all enjoyed your time with me. Thank you so very much for your wonderful review. You really made my day!!! Hatice was an excellent guide and we very much enjoyed our time with her. She was incredibly knowledgeable on all cultural and historical topics and able to answer all of our questions she also provided extensive color on things outside the purview of the arranged tour such as food, shopping, dining, and other neighborhoods. When we return to Istanbul again, we wouldn't hesitate to hire her as a guide again. Hati̇ce is the best guide ,trust me , you can sense her sincerity. She speaks good English and is very attentive to all the details. During the tour she would observe and able to offer us the amazing places to visit that suits our interest. Thank you again Hatice. for making our holiday in Istanbul a fantastic one!! Hatice is one of the best tour guides I've ever come across. She is knowledgeable, patient as well as enthusiastic. She showed us around with a lot of interest and care and we had a great time. I would highly recommend her.